This is our Easter Proclamation as we celebrate Jesus’ victory over sin and death. What a wonderful statement of faith, which is absolutely essential and central to who we are as members of the Body of Christ, the Church. His Resurrection is an absolute basic requirement for belief, along with our statement that Jesus Christ is Lord! Welcome to St. John’s Church. We give thanks for the many people who make St. John’s their High Holy Day destination, and for those worshipping with us for the first time. If it has been a few months since you have been here (Christmas) or perhaps since last Easter, you surely have noticed the wonderful changes to our facilities already completed, and also now underway! The new Ministry Center is basically completed (except for a few details) at the east side of our facilities, and the undercroft (basement) is now also undergoing a restoration, due to be completed late summer or early fall (experience has now taught us that we should stop trying to nail down dates for these things). The undercroft will include new flexible assembly space, classrooms, nursery, bathrooms, and a new kitchen! All this updated space will be utilized for church programming, classes, social events, and community use as well. But most importantly, we as a people, redeemed by the Blood of Jesus, worship Him here in the beauty of holiness, and through worship and the various uses here seek to be remade into His image. I hope everyone here today will take advantage of the many opportunities for greater holiness! This is the most important week of the year! Holy Week begins today, and between now and next Sunday you will have 13 opportunities to be at St. John’s for the public worship of the Church. Two of those worship opportunities actually happen most weeks of the year here at St. John’s: Holy Communion on Tuesday and Wednesday at 12:15 PM (preceded during Lent by private Confession from 11:30 AM – 12:05 PM). For Holy Week we add several important opportunities for worship and devotion. On Wednesday evening we have a service of psalms and lessons at 7:00 PM called Tenebræ. On Maundy Thursday the one celebration of the Holy Communion will be at 7:00 PM (no 10:30 AM Mass this day), which is followed by the stripping of the altar and an opportunity to spend time at the Garden Watch in the chapel. Good Friday starts with the opportunity to spend time at the Garden Watch (beginning at 9:00 AM) before the Good Friday Liturgy, which takes place from Noon to 3:00 PM. On Holy Saturday [Easter Even] the great Vigil Service of Easter begins at 6:00 PM, which includes the first Communion service of the Easter Feast, and on Sunday we will have the grand celebration of the Resurrection at 8:00 AM and 10:00 AM (Brass Prelude at 9:30 AM). Information about these various services can be found in the insert in today’s Order of Service called Holy Week Explained. More importantly, I cannot stress more strongly that we need you to attend these services! This is the most important week of the year, and yet only a small percentage of parishioners avail themselves of one or more of these services that lead up to Easter Day. I understand that we are a busy people, and that many of us live very far away from the church facility. But it is important for your spiritual life to participate in this holiest of weeks, and your presence will also be an encouragement to those others who have taken time and distance to be here, especially our visitors. So far this Lent we have read about praying the Holy Communion Service, the Daily Offices of Morning and Evening Prayer and techniques of personal prayer. Today we will talk about “private” prayer and meditation. Although it is called “private” prayer, because we do it alone, in fact no prayer is “private”. All prayer is joined together with other’s prayers for the same intentions. God hears each prayer individually, yet we know that even if we are kneeling down at the side of our bed or sitting quietly in a chair in our living room, those prayers are being joined to the great assembly of saints on earth and in heaven. Fr. Martin Thornton, the late great writer about English Spirituality, said that our prayer lives have to be Trinitarian in nature. In other words, it has to be balanced and equal, just as the Persons of the Holy Trinity (Father, Son, and Holy Ghost) are equal. He even assigns a Person of the Trinity to each type of prayer. The Daily Office is like God the Father, with its great orderliness. The Holy Communion is Jesus Christ Himself. And Private Prayer is the Holy Ghost – giving some freedom and empowering that freedom in prayer to be directed to the Father, through the Son. If we are “All Daily Office” at the expense of the other two, we risk becoming rigid or stale in our prayer life. If we are “All Holy Communion” we risk missing out on the bigger picture of what Jesus’ saving act was for. If we are “All Personal Prayer” we risk becoming too self-centered and self-indulgent in our prayer life, just as a charismatic who is only concentrated on the Holy Ghost is apt to be lead off on tangents that lead to personal regard for some, and rejection of other Church doctrines. So, in the next two weeks, we will start looking at various methods of personal prayer, that many Western Christians have felt helpful. But before all, just start praying by speaking to our Heavenly Father as you would someone who loves you. After all – He does! Happy Lætáre Sunday! This Sunday is also known as Rose Sunday (take a look at the vestments and hangings today to figure out this title), and in our mother Church of England it is known as Mothering Sunday (like our Mother’s day in May). Still a Sunday in Lent, this Sunday is a mid-point when we “lighten up” a bit. The deep penitential purple vestments are replaced with the lighter rose. The Latin title gives us a hint as to this lightening up of the day. Lætáre is the opening word of the liturgy in Latin, on which our liturgy is based. The first word of the Introit, sung by the choir at the 10:00 AM service, is “REJOICE”. Although a penitential season, on this Sunday we rejoice that we have passed the half-way point of Lent. We rejoice because Passiontide (the last two weeks before Easter) and Holy Week are in sight. We rejoice because Easter is just around the corner. We rejoice because to date we have kept a good Lent OR because we still have a chance to have a good Lent starting today. But above all we rejoice because we have a Saviour, Jesus Christ, who paid the price of our sins. We rejoice that in Jesus Christ we have forgiveness of those sins and are reconciled unto the Father through His blood. Speaking of rejoicing – we have taken possession of our newly renovated ministry center and offices! While work is being done on the undercroft over the next few months, we will have Coffee Hour in our new entrance atrium. If you don’t know how to get there after the service, ask someone who seems like they know where they are going. It is at the rear of the building complex. We think you will be amazed at the new facility! 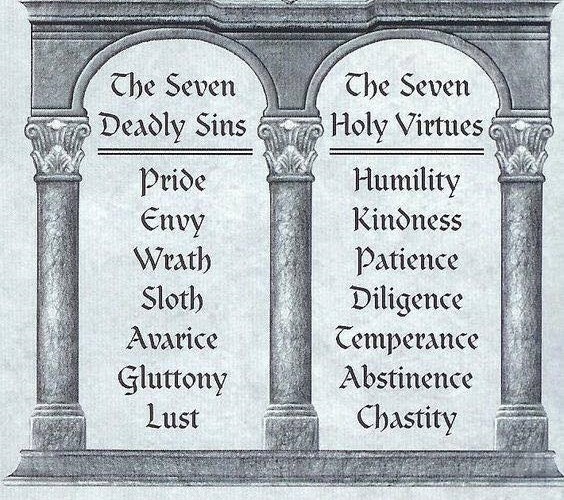 As you know by now, if you have attended St. John’s for any length of time, that I really do believe in sin, and that I find it helpful in particular to categorize what is known as The Seven Deadly Sins. I am grateful to have learned the acronym PALEGAS (Pride Anger Lust Envy Gluttony Avarice Sloth) so that their listing is easy to recite. It has been a mission to better understand them so that we can both be on guard against them to avoid their lure, or if we are tripped up by the temptations of the World, the Flesh, and the Devil, to be able then to repent quickly and return to the right path. One of the better defenses is to have a good offense! 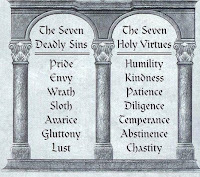 As you see on this page, there are not only Seven Deadlies, but also Seven Holy Virtues. Each one is not only a remedy for the deadly counterpart, but when practiced for their own sake, they are a wonderful defense against the temptation to fall into sin. If you are focusing on the positive of the virtues then the deadlies have an uphill battle to gain your attention or acquiescence. If you haven’t attended the Adult Education Class in Lent, you are missing out on a series on Sin, and how to avoid it. We are using two very good books as a reference: The Sinner’s Guide by Ven. Louis of Granada, O.P., and Manual for Conquering Deadly Sin by Fr. Dennis Kolinski, SJC. Both texts start by defining the sin, perhaps in ways that you hadn’t discerned, and explains why and how they damage you and your relationship with God. But both books also explain their corresponding virtues, and how they are a powerful antidote (or better yet, a defense) against those things that would do so much damage. Of course, in all of this, a good confession of sin is a great aid to your holiness. There is a brochure in the tract rack about making a personal private confession to a priest, and Fr. Bedford and I would be honored to be of help in this way. Today we have a powerful testimonial that will be shared at the 10:00 AM Service. The Dreslinskis, leaders of our healing ministry, have themselves been witness in a personal way to the healing power of God. Testimonies such as these are a wonderful encouragement to us all that God is at work in ways subtle and sublime, as well as sometimes outwardly miraculous. Thanks be to God! I saw a t-shirt for sale that said “have a miserable Lent”. I chuckled and shared it on my Facebook wall, but with the caveat that I think quite the opposite. I want people to have a “happy” Lent, and in fact have wished people just that. It sounds like an oxymoron – “happy” and “Lent”, but if we remember that the word for happy comes from the same root word as “blessed”, then it certainly is the right greeting! Lent is a great blessing, even if it is hard and time consuming. It is supposed to be. But even more so, it is an opportunity for us to be honest with ourselves about the state of our souls so that we can make inroads toward true blessedness. True blessedness leads to holiness. Lent is only miserable because sin doesn’t want us to let go of our habits, and also doesn’t like to be disciplined. But knowing that it is good for us, and is making us better, can help us go into it and through it with a good attitude. Please take advantage of the many extra opportunities at St. John’s this Lent, especially our Tuesday evenings and Friday lunchtime offerings. Additionally, much of the Lenten discipline done by you in the secret of our house and heart. Be sure to refer to our brochure The Observance of an Holy Lent. Most popular, of course, is “giving something up for Lent”. In recent years we have had a spate of “but Sunday’s don’t count as Lent” so they can have/do what they have given up. But I promise you, giving it up from now until Easter, including Sundays, is the idea of the matter, not some sort of parsing of the law. You will see the difference this sense of accomplishment achieves. Also, remember that if it is something sinful in your life, you shouldn’t be “giving it up for Lent”, you should be giving it up altogether! Remember that giving it up for Lent is about giving up something that you like or enjoy in order to be reminded that you can live without it, that you have control over your body and passions, and to give you a greater appreciation for what it is that you have and God has blessed for you. The goal is to be reminded of your ability to say no to the good and the bad if it is for the glory of God. Let us be serious about the training of our hearts and souls this Lent, that we may become the saints that Jesus wants us to be! 3. Holy Communion - Lent is a good time to add a weekday Service to your usual Sunday attendance. Weekday Services are about 30 minutes and are of a rather more intimate and quiet nature than those on Sunday. The Wednesday Service also includes the Sacrament of Healing (Holy Unction). 4. Daily Office - If you do not now read Morning and/or Evening Prayer from the Prayer Book, Lent is a good time to begin doing so. It takes some effort and discipline to get the habit established, but once accomplished, it can bear great fruit in your spiritual life. Each Office takes 10-15 minutes a day. Ask the Clergy if you need help in how to do it. 5. Spiritual Reading - An ancient custom is to take a spiritual book for regular reading during Lent. This can be a book on the Scriptures, or one of the spiritual classics. Many are available in the parish library, and the clergy would be happy to make suggestions as well. 6. Confession - A sacramental confession, in private to a priest, is not only an opportunity for a thorough self-examination, but also a powerful weapon against the temptations which come our way in Lent. The Parish Clergy are available for this sacrament, as are other priests in the area. Although the Anglican Communion does not require Sacramental Confession, it is permitted, and helpful. More individuals should take advantage of this sacrament. 7. Self-Denial - You may want to give up some special pleasure or recreation for Lent (smoking, sweets, television), and perhaps give what you would have spent on it to charity. This can be done in conjunction with other practices: if, for example, you give up an hour of TV every day, you might use it to read Evening Prayer and some Scripture. 8. Service - As well as “giving up” something in Lent, some wish to “take on” some special service, such as visiting a shut-in parishioner, volunteering at a hospital or nursing home, running errands for an elderly neighbor, or some special project at the church or in the community. 9. Scripture Reading - Delving into the Word of God is never out of season. Lent is a good time to establish (or re-establish) the discipline of a daily time of Scripture reading at home. Using the lectionary (the appointed readings) for the daily office is a good starting point. Take the opportunity in Lent to join the Adult Ed. Class on Sundays at 9:05am or Thursday evening for bible study. 11. Corporate Special Devotions - There are numerous opportunities for your spiritual growth throughout Lent. In addition to Communion and Daily Offices, on Thursdays we have Adoration and Benediction, and on Fridays at noon the parish will gather at the Church for Stations of the Cross following Mass. 12. Evangelism - Lent is a good time to renew ones commitment to sharing the good news of Jesus Christ with friends and neighbors, and to invite them to worship with us here at St. John’s. and revised periodically by Fr. Steven J. Kelly.